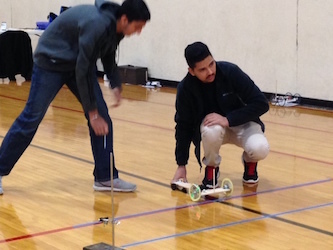 On Saturday, December 5th, 44 of our Upper School students traveled to Harlem High School in Machesney Park, IL for a Science Olympiad competition against 36 teams, including New Trier, the defending Illinois State Champion. Working primarily in teams of two, our students competed in 20 events that tested their knowledge, engineering skills, writing ability and capability to think on the spot. In addition to having fun putting their intelligence to the test, 11 pairs of students were rewarded for their hard work with top ranks and medals. Dhanya Attipetty and Rachel Brown took 1st place in the Invasive Species category. Senora Hannah Lane, Upper School Spanish teacher, aided in the training for the “Write It, Do It” competition for the first time. Sara Wagers and Gitika Chalasani benefitted greatly from Sra. Lane and took 1st place. Adam Heaps and Eli Vass took 5th place in the division in the glider event. Our teams will compete next on Saturday, January 30 at UWM, and again in ChicagoLand on Saturday, February 20, 2016 and State on Saturday, April 2 at UW-Stout.